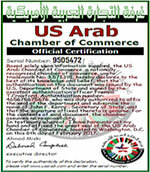 US Arab Chamber of Commerce (USACC) is a national Chamber located in Washington, DC, with branches offices in Texas, Florida, California and New York. The Chamber has been serving the U.S. business community by boosting the bilateral economic relations between Egypt and the United States. It also affixes the great seal of the chamber documents destined for use in Egypt. The price is $35.00 per stamp. examples: Certificate of Origin, Commercial Invoice, Power of Attorney, Affidavit, Certificate of Good Standing, Articles of Incorporation, Certificate of Formation, Bank Statement, Agreement, Contract, TUV Certificate, ISO Certificate, Technical Data sheet. examples: Documents certified by local Secretary of State office in all 50 states, including: California Secretary of State , Florida Department of State, Alaska Lieutenant Governor….etc. The price does not include the shipping fee. Please include a prepaid airway bill with your package.